Lot # 103: 1964 Topps #210 Carl Yastrzemski (PSA Gem Mint 10) - “1 of 3” PSA Gem Mint 10 Examples! 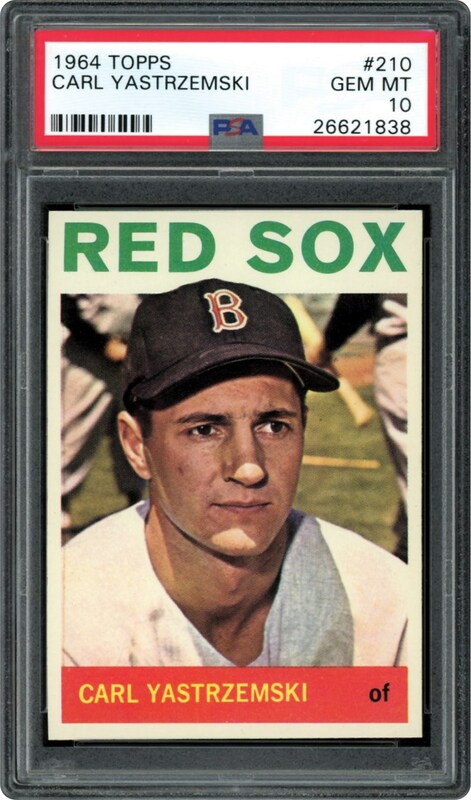 1964 Topps #210 Carl Yastrzemski (PSA Gem Mint 10) - "1 of 3" PSA Gem Mint 10 Examples! Any Boston Red Sox fan will attest to the fact that Yaz was "god on earth" to Bean-eater die-hards, with his 1967 Triple Crown season nearly single-handedly leading the Red Sox to a miracle World Series triumph. His rightful place in Cooperstown, New York was the final exclamation point to an incredible career, and this remarkable PSA Gem Mint 10 1964 Topps offering stands as the perfect testament to his unbridled legacy throughout the New England states. 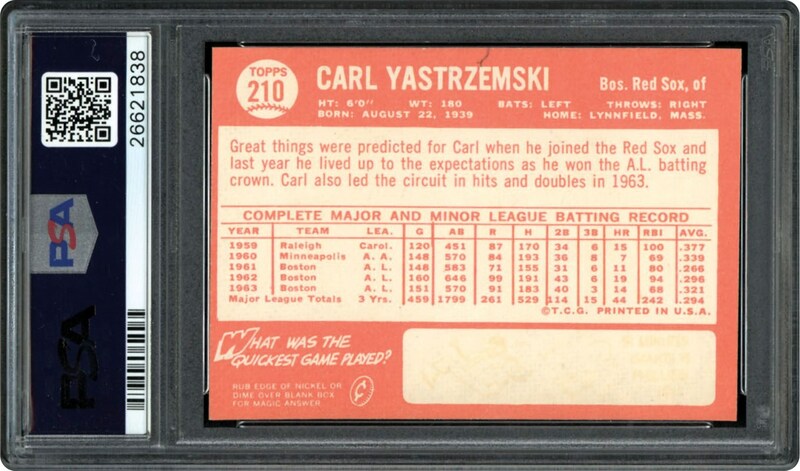 PSA's illustrious "Pop" Chart reveals that this uncontested marvel stands as one of only 3 "Gem Mint 10" '64 Topps Yaz subjects, with over 1,500 PSA encapsulated examples producing the aforementioned three perfect specimens! This truly miraculous cardboard gem portrays a breathtaking "Yaz" portrait image that exhibits sparkling facial hues, and near-perfect centering. Indeed, one of the stigmas of the 1964 Topps issue is the mass-produced subjects that reveal skewed illustrations including many titled images. Incredibly, this offering reflects no tilt whatsoever, with its magnificent centering only reflecting a slight favoritism towards the upper edge. Additional technical attributes supporting the "10" assessment include a razor-sharp perimeter, 90-degree corners, immaculate surfaces and crystal-clear clarity. A sensational "Yaz" keepsake, its sheer existence suffices as a perfect testament to his unbridled legacy with the legendary Red Sox outfielder forever standing as one of Boston's most revered icons!